Working on windows XP I have faced this problem a hunder times. 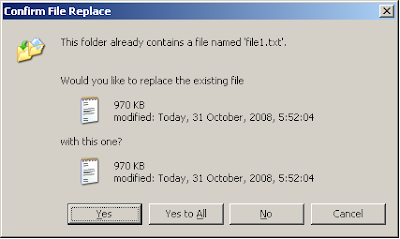 While copying files from one folder to another where the some of the file already exists we see this “Confirm file replace” dialog box. At times when there are many duplicate files, it feels stupid to keep clicking “No” or pressing “N” on keyboard. If Microsoft can keep a “Yes to all” button, why can’t they keep a “No to all”. OK, here’s the solution. Simply press and hold “Shift” key and then click on “No” button. Bang! This combination works as “No to all”. I want to buy a new laptop, but all come with Vista now, so I’m postponing the plan.. I dont wanna get vista.